Summary: Raku Ichijo is an average high school student. He also happens to be the sole heir to the head of a Yakuza Family called the Shuei-gumi. 10 years ago, Raku made a secret promise with a girl he met. They promised one another that they will “get married when they reunite.” Since then, Raku never let go of the pendant the girl gave him. 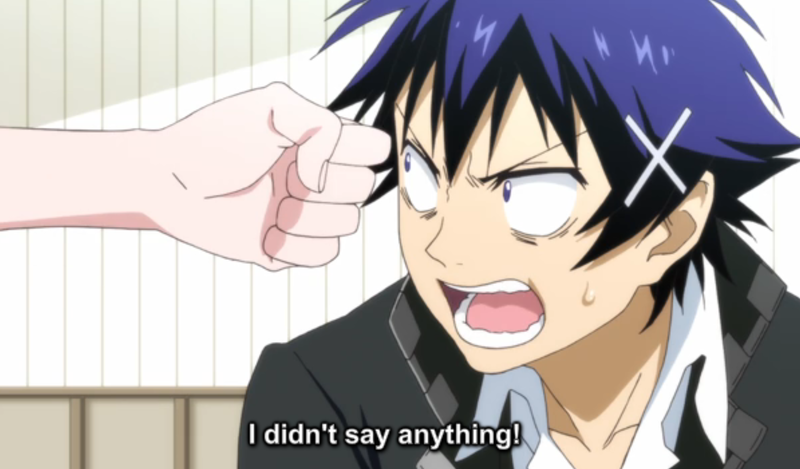 Now however, after getting a knee in the face by a transfer student, and spending the entire day squabbling with her to help him find his pendant she made him lose, Raku is told by his father that he's to be paired for three years with a rival gangs heir to make peace with a gang even if he has to fake it, right after he finally found the pendant. First Impression: Comedy. Sometimes Brilliantly funny, sometimes way too thick on the Tropes. First Opinion: I have no idea how to feel about this one. Sure, it's comedy, but I've been having my expectations fluctuate up and down non-stop the first episode, starting with the shows name and first impressions. The title, for those like me who have osmosis'd some japanese through extended exposure, is readily apparent as "False Love", so that opened a can of expectations that had me putting this off until just today. I thought it would be more drama heavy, instead of being a comedy, and I already am getting my drama fix elsewhere, so I moved it a bit down the priorities list. So it started low and then moved up higher. Then the show starts, and we're immediately introduced to the old promise through some very thick layering of the dramatic overtones on it, and since the artsy appeal of it went right over my head I was mostly rolling my eyes at it. Then we spend the next five minutes borrowing tropes from other genres of anime, culminating in the conclusive infernal girl running with toast in her mouth because she's late. UGH, GAG ME WITH A SPOON. I'm sorry, but the yakuza trope I can still get a laugh out of, and a few of the other things they did I found funny, but for the entirety of the late-toast-girl scenes I was just writhing inside my skull cringing and trying not to gag and immediately hate the show. It's a personal point of taste, so I try to control it shaping my opinions. If you like comedy, give this a solid place on your list for now. The shows enjoying itself by running a balancing act of 'Dramatic Irony' with the Old Promise, and good ol' slapstick humor, and then occasionally spicing a scene or two with some touchy-feely or drama. It feels, as a whole, pretty original. I get the impression from it that it's trying to set up some standard genre patterns and expectations, and then kick them in the shins and laugh while they jump around the room crying.